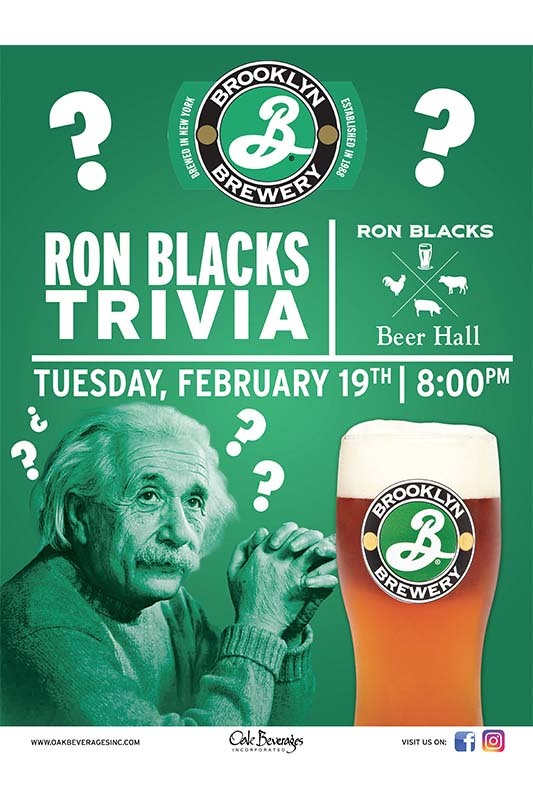 Brooklyn Brewery Presents Ron Blacks Trivia - Oak Beverages Inc.
Brooklyn Brewery Presents Ron Blacks Trivia, Tuesday, February 19th, 8pm. Join us for a night of Trivia and Pints of Brooklyn Brewery Brews at Ron Blacks Beer Hall. Ron Black Beer Hall is the perfect place to have a party. We offer forty different and always rotating draught beers and a selection of appetizers we’re happy to adjust to your suit your needs. Don’t wait any longer and contact us today to plan your next party! Our bar setup allows us to cater to groups large and small. Having a party where you need more than just appetizers, then join us for a Buffet Party. Join us for a Brunch Buffet party. Abundant draft & bottled craft beers, basic pub grub & multiple TVs in roomy, comfortable digs. Abundant draft & bottled craft beers, basic pub grub & multiple TVs in roomy, comfortable digs. Posted in Featured Promo, Trivia Night.